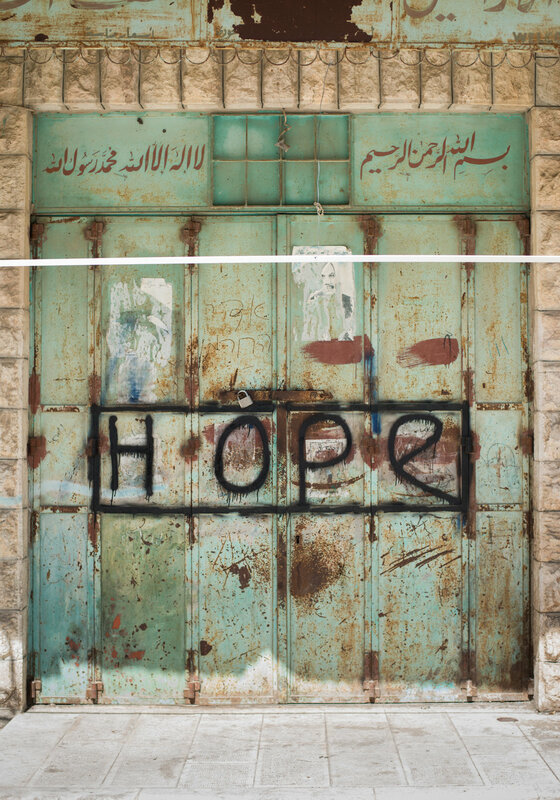 "HOPE" - On the door of his shop near the Ibrahimi mosque in the heart of the Old City of Hebron, the most intense area in one of the most conflict-heavy regions of the West Bank, a young Palestinian man has written "HOPE". He has also written it on the wall he looks at everyday across from his shop so he--and others--can continuously be encouraged: no matter what crosses one's path to have hope. April 12-16, come learn more about our Palestinian, Jewish Israeli and Bedouin neighbors living in Palestine/Israel through their visual and voiced stories featured in the multimedia project "Through The Checkpoint," created in partnership with the nonprofit Creative Visions. Artist Katie Archibald-Woodward’s hope is to help our global community gain a fuller picture of life in Palestine/Israel and compel viewers to join movements that aim to catalyze equity, peace, and coexistence without occupation for Palestinians, Bedouins, and Jewish Israelis alike. During the event on Sunday, March 15 at 3 p.m., Katie will share about the project, hold a Q&A session, and give updates on life on the ground, having just returned from the region in mid March. To learn more about "Through The Checkpoint", experience additional stories in the virtual exhibition, and partner with the project you can visit:www.lifeilluminated.com/through-the-checkpoint.